Glazed Carrots coated in a delicious mix of brown sugar and butter with a touch of salt and cayenne pepper is the ultimate quick family friendly vegetable side dish. 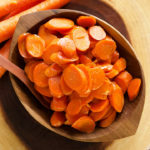 In a large, non-stick skillet (preferably one with a lid), bring the carrots, broth, granulated sugar, salt, pepper, and cayenne to a boil over medium-high heat. Cover, reduce the heat to medium-low, and let simmer for 3-4 minutes. You want the carrots to be just barely tender. Uncover the pan and turn the heat to high. Cook stirring occasionally, until there is only about 2 tablespoons of liquid left in the pan. Sprinkle the carrots with the brown sugar and butter and cook, stirring constantly, until both the butter and sugar have melted and the glaze has thickened slightly, about 2 minutes. Remove the pan from the heat, sprinkle with 2 tsp of lemon juice, and stir. Taste and add more salt, pepper, or lemon juice if desired.